Serenilite Stress Balls are carefully crafted to provide optimal comfort for your hands. 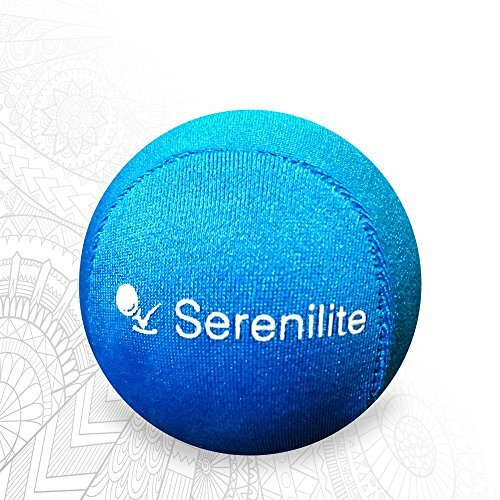 Each Serenilite Stress Ball(2.25 inch in diameter) is carefully crafted with an ultra-durable thermoplastic rubber gel encased in an ultra-smooth dual colored lycra fabric cloth that retains its shape after every squeeze. Have many deadlines to meet? Running late to an appointment? Does the phone keep ringing? Bounce back and recuperate from daily struggles in the office, home, and on the go after each squeeze. Great for muscle toning. Strengthen your forearm, hands, and fingers. They are therapeutic to those with medical conditions such as carpal tunnel syndrome as well as ADD/ADHD. Sense of touch not enough? The dual colored fabrics are soothing to the eyes and provide relief to the mind. Choose the color that suits you! Blue skies: Provides you with a calming sensation of looking up into the sky, even when you are indoors. Morning Sun: Feel a glimpse of the sun's morning and vibrant rays. Rose:Ready yourself for new hopes, happiness, and potential new beginnings. Kiwi: A ripe green and smooth to the touch. Let's get tropical. Titanium:A sleek and formal version to our current stress balls. What's Included: 1 single colored Serenilite stress ball of your choice. RELIEVE YOUR STRESS & ANXIETY Serenilite hand therapy stress balls are great for reducing physical discomfort and relieving mental tension in your body. Every squeeze will improve focus, increase strength, and soothe the mind. Relax your mind and body with your new stress ball. Also relieves anxiety, OCD, ADHD, and other spectrum disorders. STRENGTHEN YOUR GRIP, JOINTS & MUSCLES while reducing carpal tunnel & arthritis symptoms while relieving stress. Increase blood flow and circulation in your hands, fingers, & forearms with every squeeze. Optimal for rehabilitation and post surgery recovery. ULTRA-DURABLE & PREMIUM QUALITY ergonomic stress relief ball made of a tear-resistant gel core and sleek non-stick fabric. Experience maximum grip & comfort. Retains shape & smooth to the touch. We've custom made our stress ball to fit your needs. SPARK MULTIPLE SENSES by physical therapy and color therapy, improving well-being and relaxing your mind and body. Increase hand mobility & grip strength. Perfect fidget for kids and adults of all ages. Portable anywhere you go and is a great addition to your lifestyle to decrease your stress levels. Lifetime & Happiness Guaranteed! - Your satisfaction is our top priority. If you have questions or concerns regarding your stress ball, please message us through Amazon and we'll try our best to assist you! If you have any questions about this product by Serenilite, contact us by completing and submitting the form below. If you are looking for a specif part number, please include it with your message.